Philosopher Edmund Burke characterized the sublime as "whatever is in any sort terrible, or is conversant about terrible objects, or operates in a manner analogous to terror," an all-consuming experience that can either compel or destroy us. 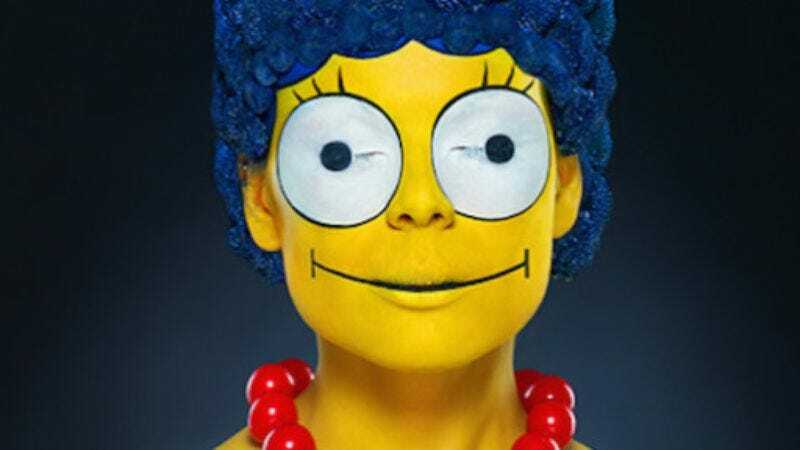 And so we find ourselves confronted with "Flower Marge," in which a young, attractive model is transformed by Russian photographer Alexander Kholov, hair stylist Mikhail Kravchenko, and make-up artist Veronica Ershova, into a goggle-eyed, mustard-skinned, Marge Simpson facsimile. Flower Marge, this emissary of Death itself, features the character's trademark tall bouffant created out of hundreds of spray-painted chrysanthemums–proving that even the most delicate of nature's flowers can become part of the fearful and uncanny, or as Burke would put it, "an emissary of this king of terrors." It's somehow even worse than Homer Simpson Untooned.